Wonderful Earl Grey Tea Bags/Sachets; tastes the way Earl Grey was meant to taste. A Serendipity favorite. To achieve a perfect harmony of mind, body and spirit, the Chinese ancients flavored their tea with the essences and blossoms of fruits and flowers. The recipe for this delightful blend was presented to the second Earl Grey in the 1880s and has become one of the world's classic teas. 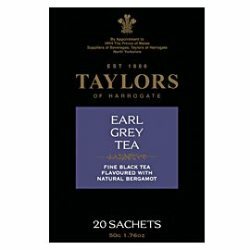 Taylors' Earl Grey is light and elegant with the delicate fragrance of Bergamot, and can be enjoyed at any time of the day.